Joni Deutsch is happy to call Charlotte home as the host/producer of Amplifier, WFAE’s new music podcast exploring the Charlotte music scene. Joni was born and raised in Charleston, West Virginia. After learning the radio ropes at WLUR 91.5 FM in Lexington, Virginia, Joni joined West Virginia Public Broadcasting (WVPB) in 2014 as the creator and host of the indie/alt music program A Change of Tune and the award-winning 30 Days of #WVmusic interview series. In June 2015, Joni became an assistant producer for NPR Music’s Mountain Stage, as well as the program’s youngest (and first female) guest host, making her the youngest host of a nationally syndicated public radio program at the age of 24. Joni’s work has been featured on NPR’s Morning Edition & Weekend Edition, NPR Music, Current, Poynter, and Nieman Lab. In 2018, Joni was acknowledged by the Charlotte Agenda’s “30 under 30” list as a young leader impacting the city of Charlotte and recognized by the Online News Association’s Women’s Leadership Accelerator. Interested in making podcasts? Join the waitlist to checkout a podcasting kit from the library! Beth Pierce: Hello and welcome to Queen City profiles a podcast brought to you by the Charlotte Mecklenburg library this is the show where we bring in prominent members of the Charlotte community for a conversation my name is Beth Pierce I’m a Librarian here at Charlotte Mecklenburg library and with me today is Joni Deutsch, it’s Deutsch right? BP: Joni Deutsch. Ok Good. JD: Like Joni German, “spreken the deutsch”, except I can’t. 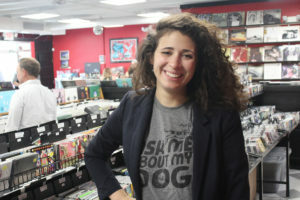 BP: Joni Deutsch is head of podcasts at WFA Charlotte’s NPR station and is the host and creator of Amplifier which is a new music podcast that explores the Charlotte music scene and has recently hit the top music podcasts on Apple. That is amazing! JD: I’m pretty excited about it. BP: Joni also acts as producer for WFAE’s other podcasts including She Says , FAQ City and SouthBound. In 2018, Joni was recognized by the Charlotte agenda’s 30 under 30 list as a young leader impacting the City of Charlotte. Welcome Joni thank you so much for joining us today. JD: Thanks for letting me be here. BP: So, we’re gonna start off with the obvious question. Since seems like no one is ever from Charlotte, myself included, where are you originally from and what brought you here? JD: I am from Charleston, West Virginia born and raised there. I was working at the NPR station there which is a statewide station and PBS as well and my boyfriend of X number of years moved down from Charleston to Charlotte for a job here and that was a few years ago and so that was my time to kind of visit him and kind of see what Charlotte was about I was just waiting for that opportunity to continue public media but here in Charlotte and WFAE had a wonderful opportunity and I couldn’t say no to it so I’ve been here now since November of 2017. So, it’s almost been a year. JD: It’s been a lot. I keep forgetting that it’s only been less than a year, but it’s been really great. Each day has been so different from the next and I think that’s why I like my job so much. It’s like I can do so many different things, as so many different people and organizations and it’s never the same. BP: Great can you give me a little bit about your background. JD: Yeah. So, I mentioned born and raised in West Virginia. I did not mention that I’m a huge dog fan, that’s a huge part of my background. I actually started my school work in science and I was doing pre-medicine as my track. Yeah, obviously that didn’t go over well for me because I am in radio now, but along the way in undergrad as I was in the lab doing research on rats and metabolic syndrome and the rats were fine they’re very cute, they’re still alive, I was wanting to do something more for fun for me and I loved music and I loved media. I’m one of those pop culture nerds that can connect the dots between an actor and like some random film. And I saw that there was a campus notice that encouraged folks to become a college radio DJ and so I was like yeah, I love making mixtapes, that’s the application is to make a mixtape. Let me see what I can do. I got on the radio there a Friday night 10 p.m. Friday show called the DJ Joni show. Yeah, I know two people were listening they were my parents. That turned into a assistant music director position at the station and then turned into assistant general manager and I just really loved music and I didn’t know that music could be a career, that radio could be a career and then that was it. So ever since then that was almost 10 years ago, I’ve been working in music discovery and doing radio on air, online and with online I did a lot of podcasts. That’s where I am today just a lot of nerdom and a lot of nerding out and geeking out but that’s I think that’s why I like my job so much as I can kind of be myself both in and out of the workplace. BP: We’re big fans of nerdom in the library. We’re cool. Can you tell me a little bit more about your role as producer kind of like all the responsibilities that go into that? JD: How much time do we have? I was reading something recently about this word “producer” because it’s just a weird placeholder, it kind of combines so many different elements so, depending on the podcast that I work with I could be anything from a part-time editor of it, to a sound designer, or the project manager to the host. I mean it really just depends on what they need me for. I think if anything I’m kind of the guide. We’re almost like a library book, they can open up like a how-to to podcasting and they can look to chapter 10 for you know ways to engage the community. “What are ways that I can use audio to encourage listeners to respond and engage with me?” Chapter 5 is you know, “what can I do to make the music pop or ways that I can make the audio really interesting?” And just go back and forth in this book. So, really whatever they need me to be as a producer. I can be there and I listened to enough podcasts not just locally but nationally, internationally where I can kind of say well I know for reference, that Serial (https://serialpodcast.org/) with Sarah Koenig used this really well in their podcast and maybe we can apply that to what we’re doing, for She Says our investigative podcast. BP: Very cool. Thank you for tying that in with the book theme. It’s very apropos. JD: My mom was in charge of a library or she was on the board for a library in West Virginia and she took me to read aloud, like every single day in the summer. I went to our local library every single day with her into the summer reading camps and I mean like I did lot for the library, with the library and one of my favorite things is books. BP: Well we love to hear that. How do you find the stories and topics of your pieces, where do the ideas for your podcasts come from? JD: Oh, so I guess individually they come from, it’s a combination of the host and the audience. So for instance, with SouthBound which is our kind of southern interview podcast with host Tommy Tomlinson. He kind of figures out, you know who’s someone that could speak to something in an engaging way. So, our recent episode was with Brooklyn Decker, who’s a Charlotte native. She’s an Actress, a model, a philanthropist, a writer; all of those things. And for her to be able to talk to not just one subject, but many in her experience in Charlotte. So he kind of decides, you know, is there something timely like football season that there’s someone that can speak to that and how it relates to living and being in the South. For She Says which is our investigative podcast, that came from the mind, in a way, of Sarah Delia who’s the host. She’s a reporter at the station on the crime and arts beat, I know they go together quite well, and you know it was just this kind of idea of this story that was brought up by a sexual assault survivor to the station and how could you serialize that or to really fledge out the reporting of it to make it stand out on its own and be impactful, and it has been. She Says, hit the top 100 podcast or 200 the top 200 podcasts on Apple, this summer, which is a major achievement. And then for FAQ City back to the audience. FAQ City is our audience powered podcast the audience decides what we answer. So the audience could ask us “Why is uptown called uptown rather than downtown, why Charlotte’s so weird that way”. And our reporter and host Nick De La Canal can report on that with a historical lens of “well back in the 50s and 40s this is what it was originally called and now it’s come to this point”. So for each of these podcasts it’s a mix of editorial judgment but then also just “What is something that audience really wants?” because we can say all we want that “You like vanilla ice cream.” You might like vanilla ice cream but it’s better if you tell us and that way we can kind of meet in the middle and figure out “Well you like vanilla but you also like gummy bears on top”. Which I do. BP: I don’t think I’ve ever tried gummy bears on top. JD: Oh it’s amazing. So good. I also came back from Italy, recently and they didn’t do anything like that. It’s more like you get two flavors in a cup with a little waffle cone on top and you call it a day. So, but again a conversation you don’t know that until you can ask around. BP: Right. Where do you find your inspiration, personally? JD: Where do I find my inspiration personally? A few different things. A few different ways. For music I just love exploring different genres, in different countries. So I find a lot of inspiration and looking into like what Norway or Iceland is doing for music. It’s a weird thing but when you wire your head around something for so long you think that’s commonplace but then when you look outside and to other genres of music, for example, then I’m kind of like oh, so there is another way to approach that thought. Also just the mood of it listening to a different genre of music you know high-tempo, low tempo, it kind of gears you up in a weird way. A different way so that you kind of, like working out. It makes you want to work out harder. Makes you want to slow down and relax. So, music is a big thing for me. For other inspiration I just really like listening to podcasts. That is my job but, it’s also what I like to do. So trying to see what other stations and people are doing and seeing, how they’re responding to subjects or engaging with people. Then I also have to say that my dog inspires me. He’s a Polish lowland sheepdog and he inspires me by being really cute and then I’m reminded that I should be grounded because if a Polish lowland sheepdog can live through 2018, I can’t talk. BP: That’s fantastic. Just a little plug for the library here we just recently started circulating podcasting kits (https://www.cmlibrary.org/blog/podcast ) for free with a library card. What advice would you give to a novice, just starting their own podcast? JD: Ooh, good question. I’d say do what is true to you. Granted you can dive into waters that you’re not familiar with and do a subject or a podcast topic like that, that’s totally fine do it, but do something that you feel like is an extension of who you are and what you want to do. Which I would apply that to anything else, a job that you’re going to do, a place that you want to be in. The second big thing I’d recommend is just not only think about the podcasts, as an extension of yourself, but as a bridge to the community, to the listener. So, I mentioned earlier about how the topics of our podcasts are kind of determined in a way by the audience, so I would just recommend thinking of your podcasts not just as something that you know is going to be great, but as something that your listener is actually going to value in their lives. What’s a question that they’re asking, that you could answer in your podcast or engage with them over. What’s something that’s missing in conversations or in media outlets or online that you can kind of fill that void with your voice, your perspective, your information. Again, it’s kind of a combination of what you want to do, but also what the audience would truly enjoy seeing you do. JD: And along the way to the fact that we, Sarah and Alex who’s another reporter on the podcast they did a great job of encouraging listeners to, if they felt safe enough, to share their stories. Listeners from not just Charlotte, but internationally, around the world, could send us a voicemail or an email and tell us their story and have this be a communal experience. And I think that’s something in podcasting, there’s a misconception that podcasting is just for your ears only, one person but it’s actually an intimate experience, that you share with a number of people even if they aren’t in the room with you. It’s a communal activity. BP: This year Joni you were recognized by Charlotte Agenda’s 30 under 30 (https://www.charlotteagenda.com/139965/ca-30-under-30-2018/ ) as a young leader impacting the City of Charlotte. What does that accomplishment mean to you? JD: That I was born in 1992 and that I am under the age of 30, it really does mean that but I’m very grateful for that being recognized that way. I still in some very small ways feel like a West Virginia fish in a North Carolina pond, which is much bigger, but I really appreciate being recognized, because if you look at the other people on that list. I mean you have people from all sectors, not just media but from nonprofit, from business, politics and I think that kind of means that, at least in the line of work I’m in which is public radio, public media podcasting, music discovery, that that’s valued in Charlotte and in a time where media sometimes is seen as lesser than or not as something to support. I think that’s a positive sign that our work is being valued and we can only go up from here. But it does mean I was born in 1992 that’s what 30 under 30 means to me. have a different mission than other commercial news outlets and media content channels? JD: I think by the definition of public media and the mission of it or even just the business side of things is different. Just because you look at commercial media versus public media or non-commercial media and yeah you’re not going to hear what is typically defined as a commercial on NPR stations but on the other hand commercial media has a lot of great capabilities. So I think there is a difference, but in terms of the place or my place or the place of public media in the world you know I just go back to my days of watching shows like wishbone (https://cmlibrary.bibliocommons.com/item/show/1230350106 ) on PBS, he is best dog, but yeah I’d go back to those days of Carmen Sandiego and Arthur, watching when I was a little kid I had no clue that that could be a career. I enjoyed it because it was made for the public without this kind of consumer interest to it and in the sense of like they weren’t trying to sell you, I don’t know like Kool Aid, on the Wishbone TV show and I think that’s why public media is still valuable decades after those experiences I had when I was younger. It still is timeless but it’s also relevant to what people need and want and it really is funded by the public. So, long as the public wants it to be around it’ll still be funded and knock on wood fifty years after the Public Broadcasting Act (https://www.cpb.org/aboutpb/act ) was signed we’re still around and I hope that we will be for another 50 years and more. BP: How would you define community engagement and why do you believe community engagement is important for the Charlotte-Mecklenburg community? JD: Community engagement such a sticky word. It’s even more sticky than I would say to a producer. To me it means a conversation and it’s not a one-sided conversation. It means a give-and-take you know public radio, just like with other media outlets sometimes we get into a habit of just saying things or sharing things and we don’t exactly ask for the audience to chime in. Granted WFAE has done a really great job of doing public conversations with Charlotte Talks or you know podcasts like She Says or FAQ City , where we’re encouraging folks to chime in or Amplifier, where we ask musicians from the community to submit their music and be a part of the series in that way. So if anything is just a way to have reciprocity in the media and to know that we’re not just sharing our own perspective but we’re trying to create a melting pot so that others are able to you know add their ingredients to the mix and we can have a really interesting ambrosia salad. So I guess the community engagement is just it’s creating that salad and to do so you need to have both sides interacting with each other and it needs to be in a meaningful way and not like a throwaway thing, like “Send us your stuff” but then you never respond to a person. BP: Can you talk a little bit about your new project Amplifier? JD: I’d love to. Amplifier is another music initiative. It’s hosted and produced by myself and I also have another producer called Cole del Charco and basically, it’s just an exploration of the Charlotte music scene. When I was in West Virginia, at the NPR station there, I did a weekly music program that was eclectic. The promise was that the program would never play the same exact song twice because there’s so much music out there, why should me repeat it. And along the way with that program, I did a local music podcast about West Virginia music because most people assumed that West Virginia had only Brad Paisley and banjos to offer to the musical world; maybe Bill Withers if people remembered that Bill Withers was actually from West Virginia but very rarely they don’t and or very rarely they know that. I came to Charlotte thinking, if West Virginia has a music scene that’s on undiscovered, surely Charlotte will have one, that is there, more active in the community that people know about. So that, if I ask them as I moved to Charlotte last year, “What is the Charlotte music scene like, where can I find it, and who are your favorite acts are in the area?”, people would tell me; but my experience for the most part at least in the different groups I interacted with, didn’t really know anything about it , they kind of shrugged their shoulders and those were people that were natives here. People that had lived here for like two decades or a decade. So, I thought you know, “I know there’s more to this story”. I know there’s actually great music here, I don’t know what it is yet, but I want to figure it out. Amplifier was the way to encourage the community through a call out, to say “Hey submit your music, go to www.wfae.org/amplifier” Any genre. Could be anything at all. You don’t have to be a recorded artist or a big label artist, just send it our way.” I expected fifty or hundred submissions and we received more than 300. JD: Yeah, and the genres. I was almost expecting it to be mostly the singer-songwriter types like ‘guitar, hat, beard’ standard. Standard Americana folky music. We got a ton of genres and they’re from all over Charlotte. It’s not just like Plaza Midwood (https://digitalbranch.cmlibrary.org/welcome-clt/plaza-midwood/). JD: A name where you would think, but it’s all over and I think that was really encouraging. Even with just putting the message out on radio, online, with social media; we received that much of a response and so Amplifier is just an exploration of it. The first month of Amplifier episodes launched in September and we did a 20 for 20. So 20 different profiles of artists in 20 days, so once every day for the month; Monday through Friday, not to mention on-air components. We had posters that we put up around Charlotte with the Amplifier logo on it. And it hit the top 30 music podcast on Apple within launch. Up there with the Tiny Desk Concert (https://www.npr.org/series/tiny-desk-concerts/ ). That’s NPR music favorite podcast. The response I received, not just from the musicians, but the listeners has been great. They’re saying that this is one of the best ways that they’ve been able to discover more about their community through music and art. That’s really what the whole point was, to have people realize that there’s a lot of great talent here, and if maybe before they can only name Anthony Hamilton and the Avett Brothers as their favorites, now they should be able to name at least five or six that are their new favorite; so they want to tell people about because Charlotte could be the next music location it just needs more support from the audience. BP: It hasn’t happened yet. JD: Yeah, and that’s just I mean that’s great. It could be at some point the New York of the south in terms of music. It could be the LA music scene but there’s so many different folks here that really care about it, and in this Amplifier series is just to say these are people that, maybe don’t make that much money making music here but they’re here for a reason. They choose to say you’re in Charlotte to make music that they love and at the very least we can at least check it out and support them in doing that. JD: Yeah, thanks! I’ve discovered some of my favorite new artists along the way too, I mean there’s so much and I featured them in the series that their voices and songs are so good and so professionally done and it amazes me that Charlotte did not have the infrastructure or maybe is now and only now in the process of having that infrastructure in place to support them. BP: You have not been here very long, you’ve only been here less than a year, which is remarkable what is your vision for the Charlotte Mecklenburg Area and what do you believe is holding the city back from achieving that vision? JD: Well, I can speak to a little bit of it at least when it comes to music since I feel like that was one of the questions I brought up a lot in the interviews with the artists new and old or established and you know emerging of what could be done, what could the city do to support the music scene? On that alone I would say Charlotte needs to figure out a way to encourage artists to support artists, so that it doesn’t feel like a standalone endeavor. So that it feels like it could be an initiative, a business. I mean that’s it what it is it’s a music business and some artists aren’t able to get that because they don’t understand the grants that they could apply for or the communities that they could collaborate with, organizations I could collaborate with for a venue space, for a recording space, just to get their name out there, the music out there. So, I think Charlotte could create a stronger connection to the community, and even just encourage businesses to look at music business a new way; rather than saying “Okay artists go set up in the corner and play music while people drink beer”, there could be a bigger and brighter spotlight on music as more than background music. Something that is active that people are tuned to rather than just “Okay there’s some weird person playing in the corner a banjo and a guitar. Let’s just not listen to them and keep talking amongst ourselves”. I think there could be things that are done with venues, with local organizations, with the Charlotte Mecklenburg City Council initiatives that could be done to really support that scene. I don’t think a lot of people I interview for this series felt like they were being taken advantage of or they’re resentful of Charlotte for the place that they’re in, but if something doesn’t change soon I could see this kind of lackadaisical like laissez-faire kind of thing just continuing where artists feel like “I’m here I’ll make the music for myself but no one values me. Why am I really doing this?”. So, I think there’s a really great turning point and along with ASC (Arts and Science Council https://www.artsandscience.org/) I think the Center City Partners (https://www.charlottecentercity.org/ ) they’re doing a great job they’re doing their ‘Music Everywhere Initiative’ (https://www.charlottecentercity.org/event/music-everywhere/ ). Little things are sprouting up around the city and I know that some of the City Council, they’re really supportive of music I think Larkin and oh gosh, I can’t remember another individual on the City Council it might have been Braxton. Who’s on the R&D in the QC Podcast? (https://player.fm/series/rd-in-the-qc ) Both of them speaking out in support the ‘Music Everywhere Initiative’. So, there is support and city government for it. I think we just need to have a more concentrated effort and it’s not just the city, it’s organizations, it’s the musicians themselves and media outlets including WFAE and Amplifier. BP: We lived in Boston before we moved here, most recently and they had a really cool thing. Some of the town of Somerville which is outside of our city of Somerville just outside of Boston but a few of the neighborhoods in Boston had something called ‘PorchFest’ (https://www.somervilleartscouncil.org/porchfest ), where there’s always two family houses all over the place in Boston, so you would just sign up and say “Hey I’ll host a musical act” and then like one day over the summer a Saturday or Sunday, houses every 50 feet or so would have like a band or a singer song or whatever on their porch for a few hours and so like you would just wander through and there would be concerts all over the place. BP: I love that idea. JD: So cool. Boston see there’s like, little things like that going back to the inspiration question. I just like learning how other people in cities and organizations are doing things. Those little things just bring a smile to my face. How can we replicate that on some level and do it here so that it’s meaningful? That’s so cool I like that. BP: What would you say is the most life-changing piece of advice you’ve received? JD: The one thing I heard when I started in public radio was from my old radio director there in West Virginia and she said that “It’s just radio. It’s not the end of the world.”, and me being type-A kind of personality, I’m thinking I need to be at 110% at all times or else I’m not doing it well. I think I’ve reduced that percentage down to like 90% now. JD: Thank you. It’s really hard, but I think that’s just something that can be applied to any situation. You know we really, especially a non-profit, we just feel like we are working all the time, non-stop, because we love doing this: it’s mission driven. If we don’t do it, what will happen the institution? All the horrible ‘sky is falling’ things, but at the end of the day, you can still relax and you can still take a long deep breath and it’s gonna be okay. I think that’s something I’ve had to kind of learn along the way is, if I don’t keep in check of what I’m doing with my body and my emotional or physical health it’s not gonna do me any good to try to help someone else. It’s like the quote when you’re on an airplane like, put the face mask on yourself first before you put it on someone. Same thing, it’s that idea of self-care I don’t know how I feel about the term ‘self-care’ but it’s a kind of self-care thing that you should take something seriously, but don’t make it super, super serious. Because it really is not the end of the world, in most cases. BP: If you could write a letter to your future self what would you say? JD: “Your hair is gonna grow bigger.” And it has. BP: I’m so jealous of your hair by the way. JD: I had a haircut just recently and I’m looking at the camera right now, I can’t even tell I got a haircut and I’m nearsighted, but I know that it’s grown, but thank you. My mom did not have curly hair, so growing up, she didn’t know what to do with it. Hers was thin, straight hair, short and I had this lion mane. But no, what would I tell myself? I think it goes back to that the quote that I just mentioned, of just having fun along the way. Which I do, I have a ton of fun in this job. JD: I love it please don’t think I hate it cuz I don’t, but I think if I were to write something to myself is that things will continue, and that it’s going to be a mix of days where you feel like you’ve conquered the world and days where you just want to hide under your blanket. And some days it’s going to be more of the latter than the former, vice versa and you can still get through it and you can still do great things and that it’s just gonna make you stronger because of it but also does not just enjoy yourself. It’s gonna be a literal ride of sorts, like a roller coaster and you’ll get out of it at the end, pretty unscathed. BP: I like that. Thinking back over the books and articles you’ve read throughout your adult life what book or article has made the biggest impact on you? They have to give you a book question. JD: No, of course you do. BP: Sort of in our contract. JD: What do you do here again? Books, right! No kidding. I think I’m gonna do two books. The first book going back to my youth was Lemony Snicket’s A Series of Unfortunate Events (https://cmlibrary.bibliocommons.com/item/show/849896106 ). It’s one of my favorite series when I was a kid. I was growing up at the time that they were still releasing them live, so that I remember. I think maybe they came out once a year or two times a year and whenever it came out, I would instantly go to wherever it was, got the book, took it out, and then found a place, and just sat there and read it; for eight hours on end. I’ve read the series through a few times since I was in middle school I think, it’s super dark, if this is the first time you’re hearing about A Series of Unfortunate Events by Lemony Snicket, you should check it out cause it’s for all ages. I think what I liked about it so much back then and I still do, is that it’s so, it’s very dark but it’s kind of realistic in some ways. You know, it’s is not the Cinderella story of a happily ever after of sorts. In fact, spoiler alert the final book in the series is just like unresolved in a number of ways but you should still read it because I think it just has so many geeky references in it to literature and arts and history that makes you want to dive into everything. To understand the references in the historical context and to mature a little bit more along the way. I think that’s what I liked about it, is that it wasn’t expected, and I think that was kind of inspirational. Not everything’s going to be sunshine and like unicorns and that doesn’t mean it’s gonna be bad. It’s gonna be pretty cool. But the second book I think more realistically or more recently that I really enjoyed and was inspired by was, I forget the exact title the book, but it’s a James Brown biography but it only focuses on like a few months of time in his life. It was during the riots that took place following the assassination of Martin Luther King Jr. At the time James Brown was set to perform in Boston and because of the riots that were taking place, the city of Boston was like “We need to shut down the concert, it’s not safe.” If people go to the concert along the way they might get mugged or they might get into attacked or become a part of the scuffle. But James Brown’s crew had conversations with the city and also worked with PBS station there in Boston at the time WGBH (https://www.wgbh.org/ ) which is still around . They decided “No. The concerts gonna go on, because this is going to be a way to unify the public and to bring them together in a way to to act as solace over what happened.” But also to just remind them that they’re lighter moments and James Brown can provide that. They actually broadcasted on WGBH, on the PBS member station there. Yeah and so people if they felt like they couldn’t leave their house or they just wanted something to lift their spirits, they could watch it live from their televisions, in their homes. I just read this book recently. I’d been working in public media for a few years by the time I read this, but I just thought it was a beautiful moment, not just for music in the country but you know on also public media. All these little things coming together, for the public good to show that music could be the thing that combines, that brings people together and unifies them. I think that was just something really inspirational and reminded me why I work in public media. BP: We got to get the title of that book. JD: I forget, how James Brown saved the soul of America (The Hardest Working Man: How James Brown Saved the Soul of America by James Sullivan https://cmlibrary.bibliocommons.com/item/show/1155025106 ) I think was the name of it. A couple years ago, I asked my mom to get me some books for the holidays. I swear for decades my parents would “Say what do you want for Hanukkah or Christmas?” and I’d say just get me books, so they’d get me a Scooby Doo books, they’d get me Nancy Drew books, and a couple years ago I said mom “Can you get me books that are music biographies? I don’t even care what they are just something.” and that was one of the books that she gave me. It’s a pretty quick read, I think it’s only a few hundred pages but a substantial amount of it towards beginning is talking about public media and the media landscape in Boston at the time that James Brown was performing there. Of course it talks about James Brown like his personality, his band, and how the show went that night, but it’s just a really interesting read and I think it’s just it’s really timely. BP: The Hardest Working Man: How James Brown Saved the Soul of America. JD: Yeah, so the book was The Hardest Working Man: How James Brown Saved the Soul of America and I would recommend even if you’re not exactly a music fan or James Brown fan or a Boston fan, go Yankees, you can probably learn something from this book that can apply to you know 2018 and where we are today. BP: Wow. I love asking people this, cause there’s always the book that I’ve never heard of never, and I’ve never heard of that one. Thank you. JD: That’s very cool. Joni how can listeners learn more about your podcasts with WFAE and where are you on social media? JD: Oh yeah! WFAE podcasts are She Says, Amplifier, FAQ City, SouthBound, you can also find Charlotte Talks which is our daily talk show it is in podcast form. You can find all those podcasts on our website which is wfae.org, specifically if you go to wfae.org/podcast you can find all those podcasts there as well as ways to listen to them on your favorite platform whether it is Apple iTunes, Google Play, NPR One and very recently we just got on Spotify; so you can listen to the podcasts on Spotify. Which is really cool for Amplifier, since we made a huge like 14 hours Spotify playlist of the musicians who submitted their work to the series; even if we didn’t feature them in the actual podcast, which I should have mentioned earlier is continuing as a biweekly podcast. There’s tons of people to feature and we’re gonna do that as much as we can and as for me people can find me on social media, my handle on Twitter and Instagram is actually my old public radio show in West Virginia which was “A Change of Tune” so people can find me @achangeoftune on Twitter and Instagram and on Facebook you know or LinkedIn they can find me under my actual name which is Joni Deutsch. BP: Thank you so much Joni. This is fantastic. This has been an informative, oh god that does sound really formal…. JD: This has been wonderful. I am human. BP: Thank you so much for being a guest on Queen City Profiles. If anyone is interested in learning more about Joni’s work with WFAE please visit wfae.org, and make sure to follow her on the social media accounts she mentioned. Thank you everyone for listening to this episode of Queen City Profiles. To learn more about this and any of our other podcasts, please visit our website digitalbranch.cmlibrary.org and follow us on Facebook at facebook.com/cmlibrary or Twitter @cmlibrary and we’ll see you next time. Thank you!